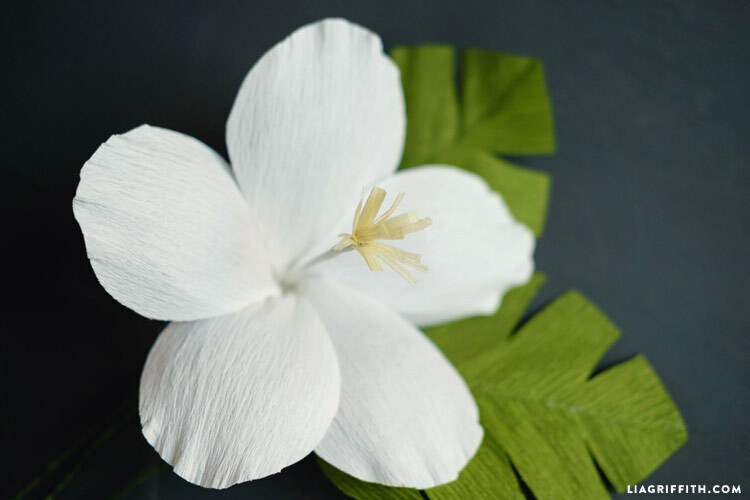 If you want to bring the tropics to your own home this summer, the best way to add some island flavor is by crafting beautiful tropical blooms for your home decor. In the past I designed a vibrant ombre hibiscus with bright oranges and hot pinks. As much as I love the color, vibrant hues do not always fit well incorporated into some home decor styles. My updated crepe paper hibiscus includes a new leaf design and an elegant white color scheme. I also used a special new technique to fuse two sheets of crepe paper together! 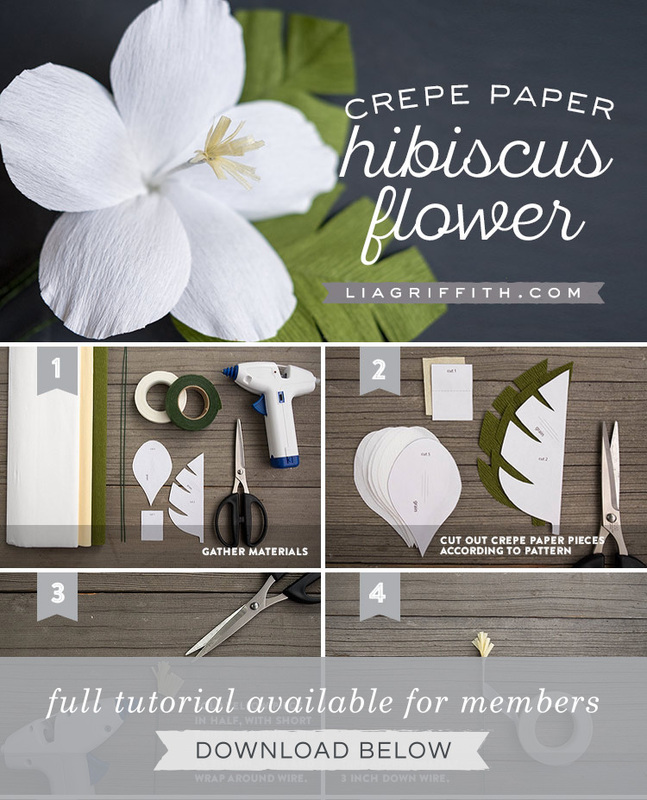 Crepe paper is a perfect material for making hibiscus flowers because it resembles the natural texture of the blooms. Hibiscus blooms are larger than many other flower blooms, and each flower features only 5 petals. Part of why I wanted to redesign this flower was to create an updated version with my extra fine crepe paper line. While the extra fine paper is gorgeous for highlighting intricate details of flowers, it isn’t always the best for larger petals because it can become flimsy. To work around this, I decided to fuse two sheets of crepe together so that the petals could be thicker. The key material for this technique is stitch witchery, which is basically a glue for fabric. You can find stitch witchery at any local fabric store. It comes in rolls similar to tape or in bolts just like other fabrics. Fuse the crepe paper together by cutting a sheet of stitch witchery the same size as your two sheets of crepe. For this crepe paper hibiscus bunch, I used the White color from my line for the petals, Vanilla for the centers, and Cypress for the leaves. Place the stitch witchery between your crepe pieces, then cover with a cloth napkin. Iron the paper with the cloth napkin between the iron and the crepe. Once the stitch witchery melts, the paper is successfully fused! I love this technique because it allows you to create crepe at any thickness that you want. You can also use this technique to create your own double sided crepe! After your paper is fused, print the PDF template below. Use each piece of the template as a guide for cutting your crepe, making sure that you are cutting with the grain of the crepe. 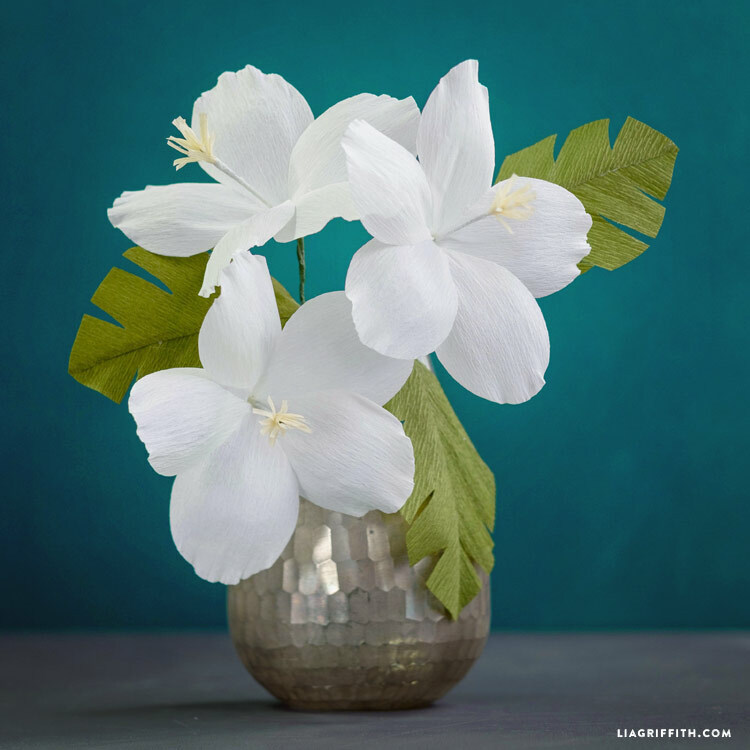 Next, follow the crepe paper hibiscus photo tutorial to craft your blooms. Because the blooms are big, one flower can be such a beautiful accent by itself. 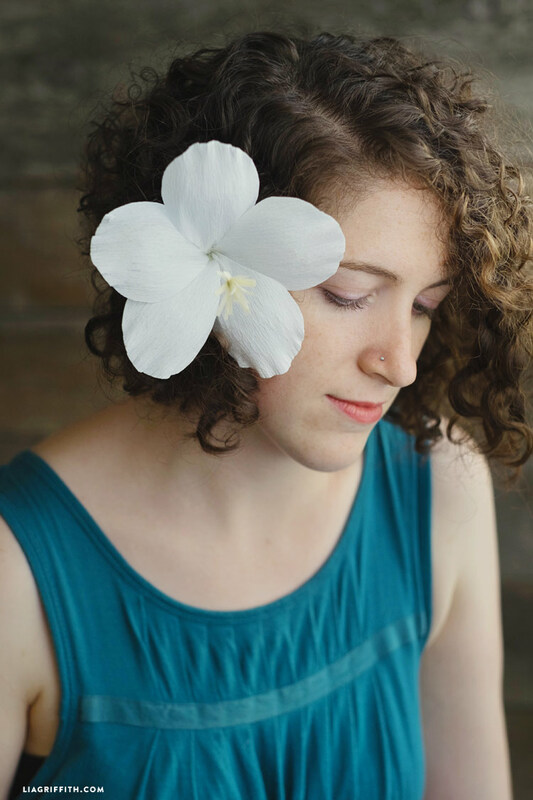 You can wear one in your hair, or you can make a whole bouquet to display in your living room. It all depends on how you want to add your tropical accent to your life! Hi Lia I have a question for you. what do you mean by “making sure that you are cutting with the grain of the crepe. ” can we get the specific glue you have mentioned in michaels because I don’t know any fabric store nearby my place. Hi Chetna! The template shows the direction you want the grain of the crepe paper going when you cut (the flower petals should be cut with the grain vertical, while the leaf shows the grain at a diagonal). I don’t believe stitch witchery by the yard is available at Michaels, but they do appear to carry a product called Heat N Bond. I haven’t tried it, but from the description it sounds like it would do the trick! The timing of this post couldn’t be better. I’ve just been given the task of creating centerpieces for a tropical themed retirement party. Thanks so much! May I ask, when is the release date on your crepe paper? I’ve been anxiously waiting to see it on Amazon or Michaels. Thanks, though, this makes me sad☹️. Believe me, I’m sad, too! It will be worth the wait. Beautiful. Do you spray with anything? Wonder how they would hold up with humidity. We don’t spray our flowers at all, as Portland lacks humidity this is not something we have to troubleshoot. Crepe is sensitive to humidity so my only suggestion is to keep your flowers indoors. Many thanks for your contribution to my love of plants. In my home I die because I have lots of natural light and every time I have more artificial, but those of shovels I do not like, I love the paper. You have exquisite taste to them and agree with Lia, it is very cheerful tropical encourages the house. Now I’m learning taking courses to make them without having to cut back because of problems with my hands. When do some, I send you a picture of the wonderful experience I have had with you and how much you have encouraged me to go ahead and make my own designs. ‘What Have a happy day !! There are printable instructions for you to download at the end of the post. Lia, this is simply stunning! Can’t wait to get my hands on your crepe paper! In the meantime, as I’m waiting patiently (not), I’ll use what I have to make this beautiful flower. Thanks for the tutorial! Wonderful! We have a lot for you here . . . everyday! Do you know when your crepe paper is going to be available? I can hardly wait! I am so glad to hear you are interested in trying out the crepe paper! Unfortunately there was a bit of a hold up with the manufacturer. We will announce in a newsletter when it is available!